Sufficient Grace Ministries Blog | New Creation…Green Kitchen…Walking With You Idea…and a BBQ Sauce Giveaway! Whew! New Creation…Green Kitchen…Walking With You Idea…and a BBQ Sauce Giveaway! Whew! *A winner has been chosen for the best BBQ sauce known to mankind…Contest is over! There are so many blog posts rolling around in my mind, that I thought I’d just combine them all into one big one. Hope you don’t mind, it’s going to be a long ride! 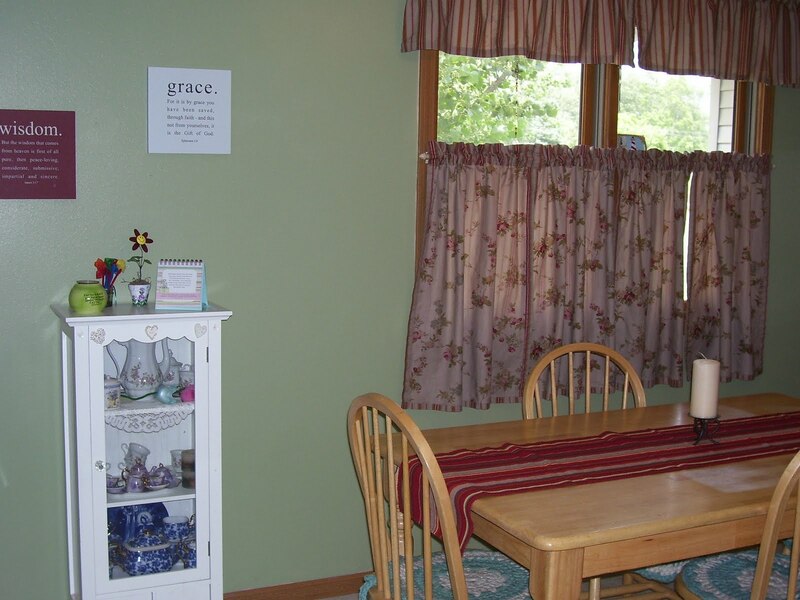 Those of you who visit regularly know that we have been very busy with Sufficient Grace Fundraising events and other ministry-related happenings. Tim and I also had the privilege of participating with a local VBS outreach in which our church brings VBS to the children and families of a local community that does not currently have a church. It is such a blessing to be part of that, and I’m so grateful we were able to join alongside our church family this year, once more. We are looking forward to VBS at our own church soon, as well. 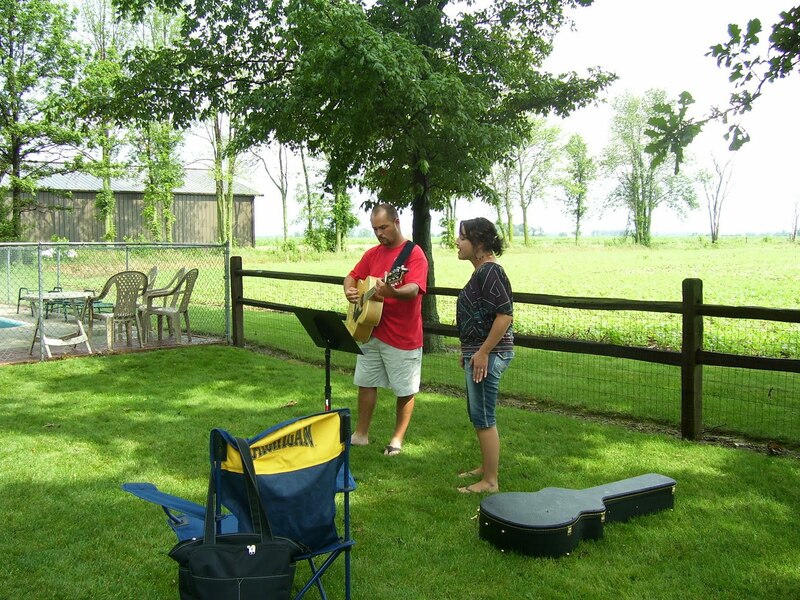 Speaking of our church family…one of my favorite events occured this past Sunday. I love a good baptism…there is nothing like it, really. A changed life in Jesus…the symbolism of reckoning the old man dead and emerging as a new creation, the washing away of sins, the bold statement that this person belongs to Jesus. This person lives for Him. I love to listen to the simple, tearful testimonies of those who have recently given their lives to Jesus…telling of His life-changing glory. The beauty of redemption never fails to move me to tears as well. What made this particular baptism even more precious was that our sweet James had chosen to be among those getting baptized yesterday morning. As Tim and I prepared the music, I reflected on the words…”feels like I’m born again, feels like I’m living…for the very first time, for the very first time…in my life”. It never gets old. Watching the Holy Spirit work in someone’s life, watching Him speak directly to a seeking heart, wooing with the Father’s love. Seeing a heart transformed by Jesus…a life redeemed, bathed in beautiful, saving grace. But, when that heart belongs to one that I love…it fills my own heart to the point of bursting. My cup runneth over…and, once more, I am on my knees in awe of the grace of my God…and the relentless love with which He pursues and pours out onto His people. Oh…how I love a good baptism. I’m so thankful for the answered prayers. God has written a story for our family that is beyond anything I could have imagined. There were years of drought and wandering in the wilderness, but lately, I have been dancing in the rain as He brings more of our family into His family. 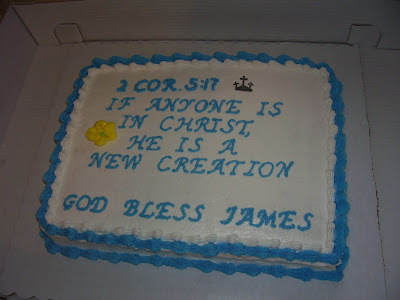 Sweet James, we pray God’s continued blessings for you as you walk with Jesus. We are so blessed that you chose to be baptized and so grateful for your soft, tender heart. We love you! 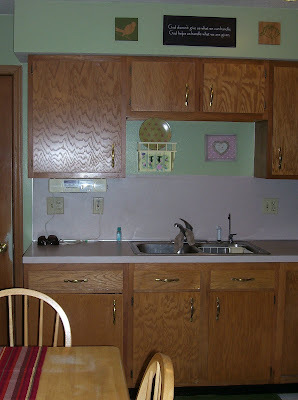 I’ve been thinking about painting my kitchen green for about four or five years now. Each year, I purchased a little something to go with my imaginary green kitchen, in hopes that I would one day just do it. The pre-working-full-time-and-leading-a-ministry me would have had the whole house painted in a week. But, the me I am of late struggles to get to the “making my home a haven” part of my resposibilities. It just seems to have slipped on the priority list, under a heap of other demands for my time. But, God has been convicting my heart lately on that subject. Serving my family by making our home a beautiful and orderly haven needs to have it’s rightful place high on my to-do list. So, in an effort to make that right…and in the willy-nilly spirit of summer, I give you my green kitchen! We’ve been taking a little break from Walking With You. A few more people are catching up with the recent Threads of Hope bible study that we finished in May. Because I know that many people are busy, I’ve been thinking about how to proceed, and I have a couple ideas. Prior to the Threads of Hope study, we shared our stories piece by piece, reading one another’s journeys and encouraging each other along the way. The purpose of this group is that grieving hearts would know they are not walking this path alone…that there is comfort and hope and grace along the journey. One way I was thinking we could do this, is to feature a blog of one grieving mama each week. I will do a post on the Walking With You blog letting you know who is being featured, and others who have walked this path can go and offer a word of encouragement, prayer, or scripture on that person’s blog. That way, instead of having to prepare a post and visit all of those who link up, we just have to visit one person, focus on their story, pray for them that week, and leave a comment on their post letting them know. I have come across many families who have lost a child, and some have readers. While, some do not have many. We would like to welcome anyone to join in…those new to grief, as well as those who have experience walking this path and can be an encouragement to those in need. If you would like to be featured on Walking With You, please go to the Walking With You Page and leave a comment letting us know your name, blog name, and your baby’s name. I think this could be a great way for us to reach out and get to know other families walking this path, as well as to offer hope and encouragement to one another. I hope you feel the same, and I’d love any input on this idea! Another favor I’d like to ask is if you are participating in Walking With You or would like to follow and read along, offering encouragement to others, please become a follower of the Walking With You blog. I will be putting up a follow button there for those wishing to keep up on that page. It is now a separate blog, although it is linked to this one. Around Christmas time, we received a gift from our friends, Glenn and Toni. 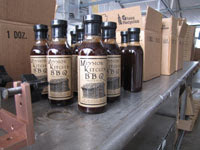 It was a container of barbeque sauce produced locally from Mission Kitchen. Little did we know that in that container, just waiting for our discovery, was the best barbeque sauce known to mankind! Let me tell you, we are conoisseurs of sauce. We love the honey mustard, hot mustard, barbeque, sweet and sour…oh yes, we do. And, our James is the biggest connoisseur of all…especially of the BBQ sauce. Why, he even eats it on his burgers…yes ma’am. So, when the sauce was finally gone, I contacted sweet Toni to inquire as to how I may obtain more…so that I could continue to slather the barbequey goodness all over our food. When I visited the website she passed on to me, I was even more delighted to learn that there was a story behind my newly beloved sauce. Ya’ll know how I love a good story behind the story…and even more so when that story shares about a mission. This sauce was created when the originators were in the mission field…and their mission continues through the distribution of this perfectly blended symphony of spicy and sweet goodness. Mission Kitchen Ltd is a local business with a global conscience. Our personal lives affect, both positively and negatively, those of others across the globe. Mission Kitchen Ltd is dedicated to empowering the population San Juan de la Maguana, Dominican Republic. A portion of all proceeds will return there to benefit the shoeshine boys and undernourished children who live on those streets and call that place home. PRAISE God for James's baptism!!!! Such a blessing!! It really does always bring tears to my eyes every time someone makes such an important and heartfelt decision! I love that song. I think it is the perfect song for a baptism! congrats to James! 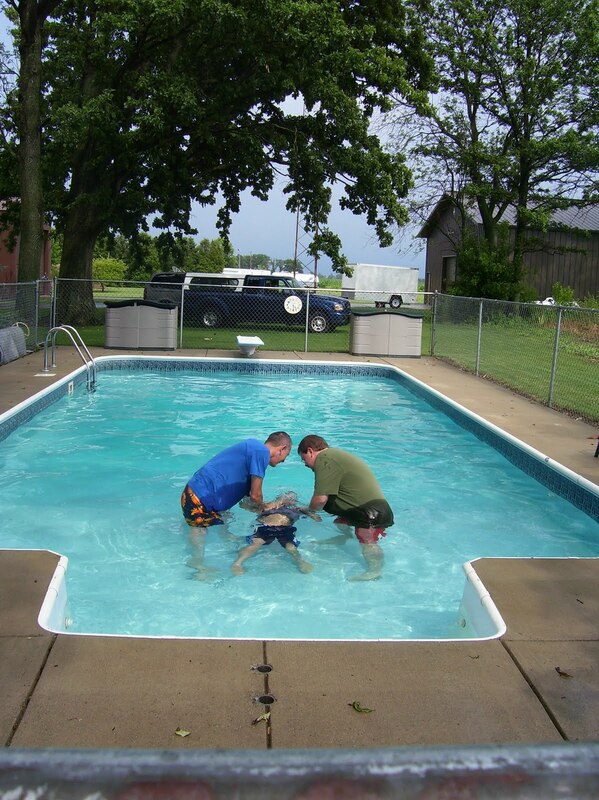 I love reading about baptisms and they bring tears to my eyes every time!!! We are having a baptism ceremony at our church soon too and I can't wait! I love that song too!! I know you must be thrilled about James' baptism! I really like the way the green looks, Kelly. A good change IMO! That bbq sauce must be pretty good! Sign me up! I like your idea for Walking With You. Yay, James!!! Kelly, I know you are so thrilled! That is the most significant event for anyone! I love your kitchen! 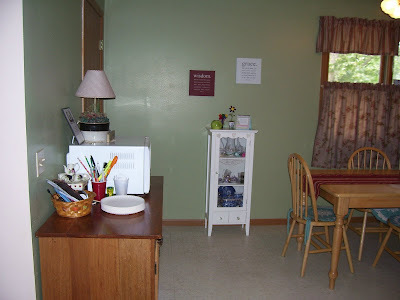 We just covered over my green kitchen, much to my dismay! I love green! Thank you for sharing today! The green kitchen looks nice. And the BBQ sauce sounds awesome! Quite a lot going on in your life right now girl! Have a great week…and may God continue to bless! OOPS! I meant to say "golf"…not "gold" tournament. BBQ sauce sounds very good. I love your green kitchen, nice change. I am so proud of your son, this brought tears to my eyes. I wish I had a relationship with God when I was young. Never ever have I blogged or left a comment on a blog until now. But the opportunity to win a bottle of the Mission BBQ sauce I cannot let pass. It really is the best BBQ sauce -my kids LOVE it. So thanks Kelly for your wonderful blog, your gift with words and the chance to score some more of the best BBQ sauce in the world. I cry whenever I witness a baptism. Every single time! 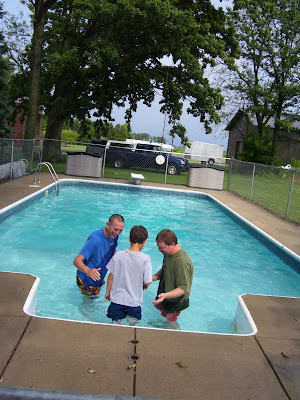 I had shivers running down my arms as I read about James baptism.. PTL! Your kitchen looks beauuuutiful Kelly! I am a green girl too..I mean… I like to paint things green.. and you did a great job! Isn;t it great to accomplish something something that has been on your "list!?" Thanks for stopping by and visiting the other day. I sure wish you and Jenilee could make it to The Relevant Blogging Conference in PA in October… Think on it? Angie Smith will be a speaker!! Yeah James! That wonderful! Praise God. Your kitchen looks great! I had that same color in my bedroom a while back – when my bedroom was upstairs. I love that green. Sorry you haven't been able to comment on my blog. That's strange. I'll see if I can figure it out. 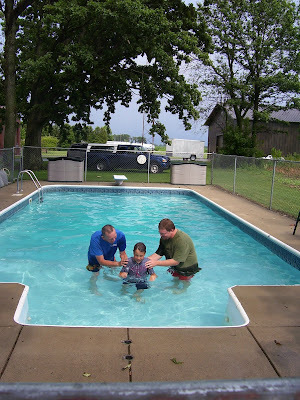 The baptism made me a teary! Girl! That was some sandal takin' off walkin' barefeet kinda moment!!! Enjoy! I think your house is beautiful. You're being too hard on yourself! Congrats to James on the baptism. What sweet baptism pictures! I love that picture of dancing in the rain verses wondering in the wilderness! I soo know what you mean! Hey, if you haven't picked the winner yet, put me in! The green looks nice. Glad you got to do it! PS my word verification tonight is "lostu." Kinda appropriate for talking about missing a baby eh?